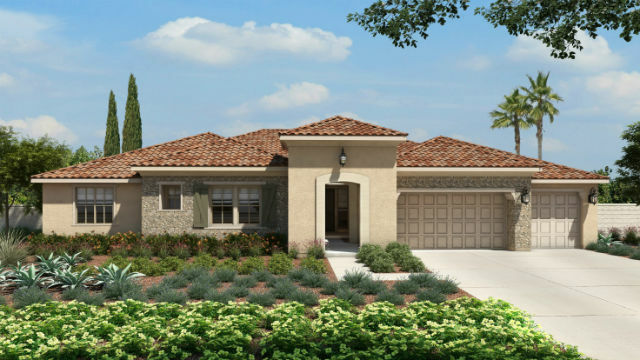 One of the home designs for Olive Hill in Bonsall by Pardee Homes. The trend of increasing prices and lower sales totals for single-family homes in the region stalled last month, according to data released Thursday by the San Diego Association of Realtors. The median price of a house in August was $610,000, about $5,000 less than in July. Meanwhile, 2,153 houses sold last month, or 49 more than the month before. The San Diego real estate market has been hamstrung by declining inventory over the past year or so despite continued high demand, meaning rising prices but fewer sales. The trend was illustrated in the year-over-year figures, with the median price of a house that changed hands up 8 percent in August from the same period in 2016, and the number changing owners declining by 6 percent. For attached homes like condominiums or townhouses, the median sales price in August was $400,000, down $5,000 for the month and but up $25,000 since August of last year. The SDAR said 1,095 condos sold last month, down 3 percent from the month before and 11 percent below the same month in 2016. The most expensive residential property sold in San Diego County last month was a remodeled 2,300-square-foot beach cottage on the bluffs in Del Mar, for $10 million. The 1948 home has two bedrooms and three bathrooms.